RALEIGH, N.C. – November 28, 2018 – For the second year in a row, The Special Event Company joins Special Events magazine’s 17th annual list of the 50 Top Event Companies. The magazine is the oldest and most highly respected journal in the international live event community. Its list ranks event companies by average annual revenue from producing special events, the number of special events organized, and their expertise in the events industry. The Special Event Company has continued to grow throughout 2018 on local, national and international levels. The Raleigh, N.C.-based company, which averages 100 events per year, works with a diverse list of clients and events. The year has seen the company deliver events for customers spanning the country from North Carolina to California, including First Citizens Bank, Boy Scouts of America, Credit Suisse, Pepsi Bottling Ventures, BASF, International Society for Neuroscience Research, and NC Museum of History. The company also celebrated 30 years since its foundation this year. “I’m so proud that The Special Event Company has earned its place among the best event companies in the world and look forward to remaining there by continuing to deliver outstanding customer service with innovative and engaging experiences,” continued Webb. The Special Event Company (TSEC), voted one of the 50 Top Global Event Companies in 2017 and 2018, has provided exceptional strategic and creative delivery of meetings and events since it was founded in 1987. From its headquarters in Raleigh, N.C., the company executes programs for global clients across many industries by offering turnkey service for site selection, planning, logistics, production and audio visual, transport, collateral and graphic design. TSEC’s professional planners budget, design and execute award-winning programs that exceed clients’ goals and deliver excellent ROI for their organizations. TSEC is a WBENC-certified woman-owned business. 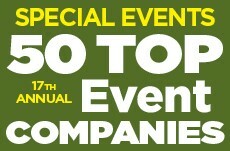 For more information about Special Events magazine publication, please visit http://www.specialevents.com.